Goole, East Yorkshire operator Cairngorm Travel has confirmed its intention to replace its entire fleet with Volvo vehicles. After testing out a selection of Volvo B11R 9700 integral coaches, the operator says it has been very impressed with their features and build quality – as well as the overall support on offer at Volvo. 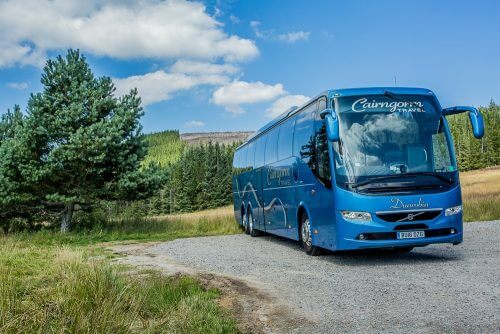 David Southcott, Operations Manager at Cairngorm Travel, said: “For the exclusive holidays and tailormade tour work we carry out, we feel that the quality interior features as well as the aesthetic appearance of the Volvo B11R 9700 meets our requirements and those of our customers perfectly. We genuinely believe this to be the most stylish coach on the road. “Since working with Volvo we have received first class support from Bob McGarry, our Volvo Retail Bus & Coach Sales Manager who has been extremely helpful throughout and feel he really does have our best interests, and those of our drivers and passengers, in mind.